I rarely ever crave or create desserts, but these chewy bars are so worth the lifetime on the hips. I developed the craving when my friend Dan posted a picture of his M&M cookie from a bakery in Dallas. I searched all of Portland, and never found a single M&M cookie. So we made these. 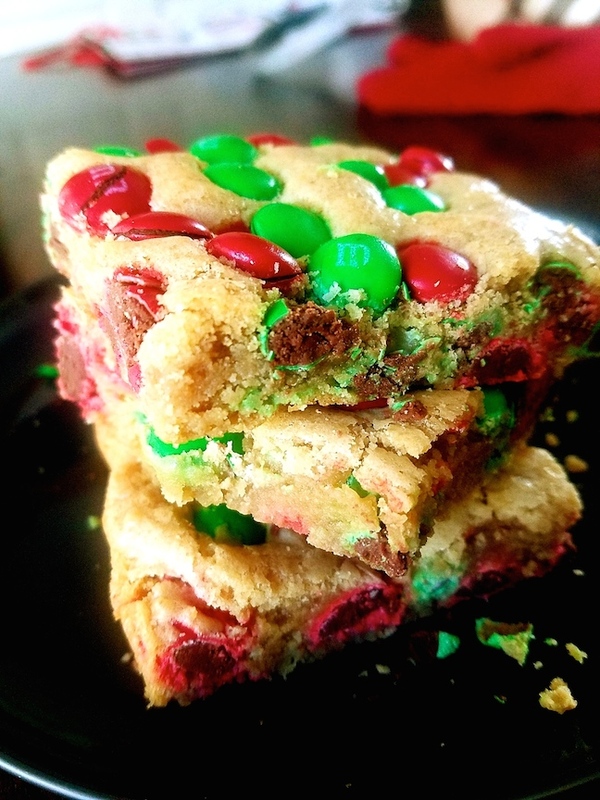 When I Googled M&M blondie recipes, the one that caught my eye immediately was from my favorite Iron Chef Michael Symon. The year that I started blogging, I was creating recipes in my kitchen that I had built, where I had chosen every detail. My friend Scott had design credentials from a school in New York, and he'd taken me on a shopping spree. In one afternoon, he laid out all of our finds to make my new house a comfy home. I was quite passionate about cooking new things, and I loved sharing the recipes. My older posts are amateurish, but they were fueled with excitement. I never cared who read, but friends were telling me they loved my posts, even though they didn't cook. When I decided I was tired of outside sales, my husband let me quit my job. It came with a price. We had to sell our house that I loved. When I lost my dream kitchen, I lost a little of that food blogging love. I buried all my feelings away and lost myself every single day at Barnes and Noble. I read cookbooks in their entirety, looking for something to keep me going. The two books that I remember were from chefs Michael Symon and Sam Talbot. The Sweet Life is about Sam's life as a diabetic. I loved his voice in the book, and I was inspired to share my own voice in the same manner. I started cooking with shirataki noodles, and I never forgot the moment he had the best pork chop of his life. I was hoping he would win this season's Top Chef, and I was shocked when he made his exit. I hope to visit his new restaurant Pretty Southern in Brooklyn. I have never tasted scallops in my life but the picture says it all! I would love to try it and thanks for the recipe as it made the work easier .